Porter — a roasty, but balanced ale. Porters are average strength ales. Many classic examples fall in the 12–14 °Plato (OG 1.048–1.056) range and ferment out to make beers around 5% to 5.5% alcohol by volume. (I’ll reproduce the BJCP stats below.) Porters are generally moderate to full bodied, not dry (like a dry stout) or sweet (like a sweet stout). The roast flavor is complemented by the hop bitterness, often centering around 25 IBUs. The best porters balance all these elements into a flavorful, but well-integrated, beer. Although the roast character is prominent, no single element should completely overshadow the others and no single element is going to make or break your porter. In this series, I’ll discuss brewing porters on home, with a focus on your water (today), dark malts and special techniques for all-grain and extract brewers. I’ll also discuss specialty porters, including smoked porter, coffee porter and vanilla porter. Darkly roasted grains are more acidic than pale malts. In a dark beer, they can cause the pH of the mash to drop below the optimal range (pH 5.2–5.6). This will negatively effect the ability of the amylase enzymes to convert the starches from the malt and the resulting beer may taste overly acidic. Low wort pH can lower hop utilization and make the finished beer taste thin. It also masks the flavor and aroma of the dark grains. However, if the brewing liquor (treated brewing water) contains enough carbonates, the excess acidy is neutralized. In a dark beer, if the mash pH falls into the right zone, the post-boil pH and finished beer pH should also fall in line. Carbonates can be added to the mash by adding either calcium carbonate (chalk) or sodium bicarbonate (baking soda). In any beer, you need calcium ions in the mash (for a variety of reasons, including stabilizing the amylase enzymes). However, calcium ions — via a reaction with malt phosphates — also lower the pH of the mash. So, when making your brewing liquor for a porter, you want to have sufficient calcium, but not too much more as you’d simply need to add more carbonate to counteract it. At a minimum, you should have at least 50 ppm calcium in your water, with 100 ppm being better. I like to shoot for roughly 100 ppm calcium and around 300 ppm of carbonates (or roughly 300 ppm alkalinity as CaCO3) for my porter water. If your water is lacking in both calcium and carbonates, add chalk (calcium carbonate) until you reach 100 ppm calcium, then add baking soda to reach your carbonate target. If your calcium levels are at or above 100 ppm, use baking soda to treat your water. Be aware, however, that adding baking soda could result in sodium levels exceeding 100 ppm, which you don’t want. (In 10 gallons (38 L) of water, 13 g of baking soda would yield 94 ppm sodium, assuming the initial level was 0 ppm.) If your tap water has high levels of calcium, try diluting it with distilled water until you reach a reasonable level, then add baking soda as needed. If you start with 10 gallons (38 L) of distilled or RO water, adding 3 g of gypsum, 3 g of calcium chloride, 6 g of chalk and 9 g of baking soda would yield a brewing liquor suitable for brewing a porter. This also yields a chloride to sulfate ratio around 1:1. In a brown porter, you might want to slightly shift the balance towards chloride. In a robust porter, you might want to shift the balance slightly towards sulfate. Extract brewers do not need to worry about their mash pH or calcium levels in their brew. The malt extract should have sufficient calcium. However, the dark grains — whether steeped or partial mashed — can still lead to an overly acidic brew. If possible, adjust your carbonate levels by adding some baking soda. If you use 5.0 gallons (19 L) of distilled water as your brewing liquor, adding 9 g (about 2 tsp.) of baking soda will add enough acid to neutralize any excess acidity. Many extract beers do not require any water treatment beyond filtering out or otherwise neutralizing chlorine compounds. However, as it’s one of the darkest brews, adjusting your brewing liquor will help your extract porter be it’s best, especially if you have soft water or water that’s low in carbonates. 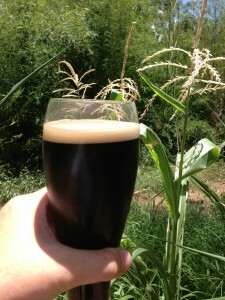 In the next installment in this series, I’ll discuss dark malts and formulating a porter recipe. I believe you meant to say “sodium” instead of “chloride” here. There is no chloride in baking soda. Whoops, yep. You don’t want to exceed 100 ppm sodium. (The maximum recommended level for chloride is around 200 ppm.) I’ll correct this. Great material here Chris. I love the detail you’re going into with these series. Water and mash pH is such an important factor and usually does not get the attention it should. Isn’t the relationship between stouts and porters the other way round in that stouts are a descendent of porters via ‘stout porter’? Yes. Porter to stout porter to stout. Fixed. Stouts are a descendant of Porter. You might want to add an alternative method to using the dark grains (60 Lovibond and above) during the mash. I would refer to Gordon Strong’s Brewing Better Beer for more details, but the gist of the method is that you treat dark grains like coffee and only steep during vorlauf or separate from the mash like you would in extract brewing. Luckily, most dark grains are already fully converted or unconvertable (darkest malts) during toasting and roasting so that it isn’t necessary to mash them anyway. This method allows you to avoid some of the harsh acrid flavors that can happen due to long mash times with dark grains and can provide more of the hidden richness and complexity that these malts have to offer. It has worked very well for me, YMMV. Just my two cents. Yep. I mentioned this in another post in this series. You can also add dark grain extract (made from steeping) near the end of the boil. Lots of interesting options.